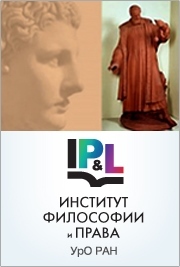 Materials of theoretical seminar taken place at the Institute of Philosophy and Law on October 14, 2015. Spokesperson: Doctor of Philosophy, Full Professor, Full Professor of Social Philosophy Chair, Philosophy Department of the Social and Political Sciences Institute, Urals Federal University ELENA TRUBINA. Стартовала подписка на 1ое полугодие 2010 Подробнее об условиях и вариантах подписки смотрите вкладку Читателям - Подписка.